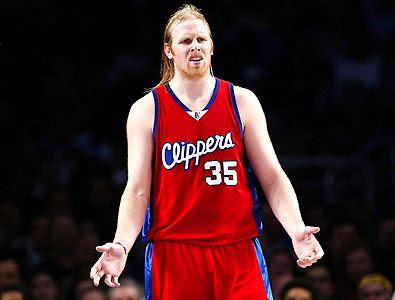 The Clippers are trying to move Chris Kaman. The Jazz are going to have to dump either Kirilenko or Boozer this year (or see Boozer walk), and the way Millsap is playing, I'd rather it be the latter. And yes, Boozer for Kaman straight up works from a salary cap perspective. Oh, and did I mention that Kaman has ADHD? I think that will go over quite well with Jerry at practice. Upside: The Jazz get a young, high-quality big man who blocks shots and boards like a maniac. They also get something in return for Carlos. Downside: The aformentioned ADHD, Kaman gets hurt a lot (but then again, so does the Booze), and the unfortunate possibility that the Clippers might not be interested in the trade because it doesn't really solve their Randolph/Camby/Kaman logjam that's making them want to move Kaman in the first place. I've been thinking about that trade recently. In the now, we can shift Okur to the 4 and bring 'Sap off of the bench again (or start 'Sap & bring Okur off the bench... with AK). But in the future (see: next year), does it impact Okur coming back? Or 'Sap, because one of the 3 will have to come off of the bench. And doesn't adding Kaman just make cap space after the year (to resign everyone) a bigger problem than having Booze walk? Does it at all matter that he's hideous looking? Well, the nice thing is Kaman makes less money than Boozer so in some ways it helps. But you're right in that another sense it doesn't because we still have to dump someone or else pay the luxury tax. However, if we had Kaman, Okur would be more expendable. I like Memo, but a Millsap/Okur front line is just as bad if not worse than a Boozer/Okur front line in terms of defending big bodies. As for Kaman's looks, I like the fact that if he were on the team we'd have the worst looking player in the NBA and the best looking (Korver). As Boozer sits on the bench more and more this year, I become more and more convinced that his mind is already in Miami. Agreed. You should check out today's D News article in which he lists his "friends" in the Heat organization. Let's just say they include the owner and former players like Zo. . . it's not a short list. The order is based on the players ability to further the previously mentioned stereotypes. Kaman is too good of a defender to be #1, however, his looks still put him near the top of the list. Another option is too rest D-Will for the remainder of the year rather than risking further injury, tank the season, get a top 5 draft pick and select Tyler Hansbrough who would fit in brilliantly. So my proposal is to bring back D Will, Milsap and Brewer. Keep AK, Memo and Harpring (strictly for stereotypical purposes) and get 6 of the aforementioned individuals to fill in the gaps. That would make my day. PS Bring back Gerry MacNamara! This cannot have effect as a matter of fact, that is what I suppose.